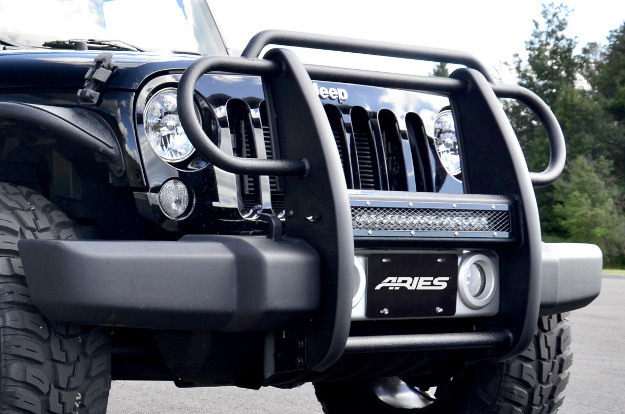 ARIES Jeep grille guards are built to be a perfect fit for the Jeep Wrangler, from their no-drill vehicle-specific brackets to their contoured headlight brush guards. We offer two styles and two finishes of our Jeep Wrangler grille guards: a Pro Series™ grille guard that features integrated LED light bar customization and our standard Jeep grille guard in semi-gloss black. Both feature a strong, one-piece design and are constructed from high-strength carbon steel for extra front-end protection. The Pro Series™ grille guard for Jeep Wrangler has a unique design with its patented LED light bar housing. The center crossbar houses a 20" single-row LED light bar and features an interchangeable cover plate to protect and allow for easy customization. The Pro Series™ grille guard also has a unique offroad-ready textured black powder coat finish. It not only protects against rust and the elements, but the textured surface helps hide minor scratches and grime accumulated on the trail. 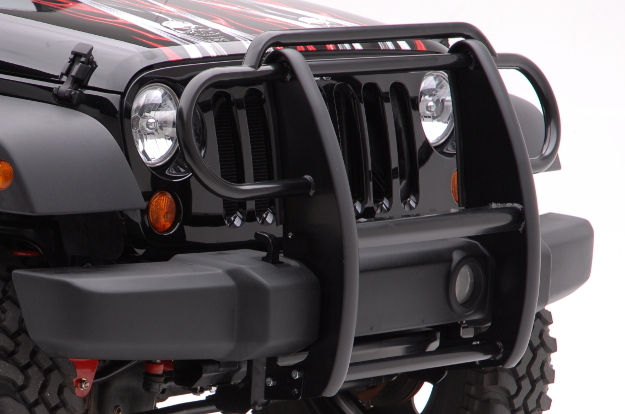 Like Pro Series™, our standard grille guard is designed for a custom fit on the Jeep Wrangler. From its mandrel-bent, rounded headlight rings, to its welded risers, to its vehicle-specific mounting brackets, the ARIES Jeep grille guard provides a contoured fit for easier installation, better strength and a seamlessly integrated look. The ARIES Jeep grille guard also comes with two pre-drilled holes in the center crossbar. These holes can be used to mount LED work lights or a light bar.